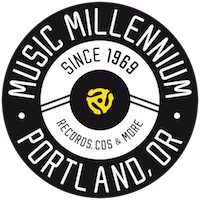 In addition to an instore signing and Q&A, a drawing will be held where one lucky customer will win a FREE vinyl copy of Dr. Demento Covered in Punk signed by Dr. Demento, John Cafiero (Osaka Popstar & Producer), Jerry Only (Misfits), Fred Schneider (B52s), Dennis Diken (Smithereens, Osaka Popstar), Sal Maida (Roxy Music, Milk ’n’ Cookies, Osaka Popstar), Dean Rispler (Dictators, Karen Black, Osaka Popstar), and interior illustrators Evan Dorkin & Sarah Dyer! Forbidden Planet is starting 2018 off with an event of DEMENTED proportions! 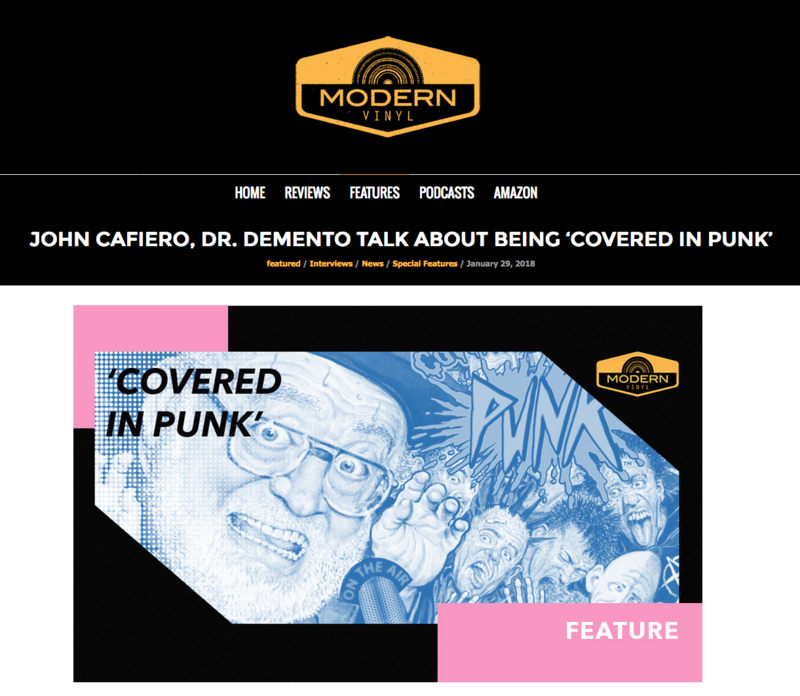 On Thursday January 11th from 6:30 to 8:30PM Forbidden Planet will be “Covered In Punk” thanks legendary weirdo radio personality Dr Demento and punk rocker/pop culture aficionado John Cafiero. 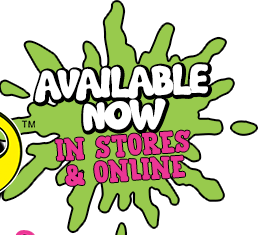 Forbidden Planet will host an in store signing in celebration of the release of “Dr Demento Covered in Punk”! Cafiero has assembled one of the most eclectic all star line ups of musical artists in the history of recording to create a two hour album presented in the style of a Dr Demento Show radio broadcast. With classic novelty songs being covered by legendary punk musicians, and infamous punk songs re-imagined in newly demented versions by some truly mind-blowing recording artists, plus an extensive booklet, and packaging illustrated by some greats from the fringe of the comics world—the Doctor is in and he’s ‘Covered in Punk’!. But who exactly will be celebrating with us? Just take a look at this epic guest list! You’ll not only be able to pick up a copy of Dr Demento Covered in Punk (a day earlier than it’s official street date), you can also grab some of the really wild tie-in merchandise like a William Shatner shirt in the style of The Cramps Bad Music For Bad People album designed by original cover artist Steve Blickenstaff, a Demented Punk Records logo enamel pin, and a slew of other demented products. Where other than Forbidden Planet would you be able to meet all these wonderful people… AND get their autographs on the new Dr Demento record? Nowhere, that’s where… so join us on January 11th at 6:30 for an event you will never forget! 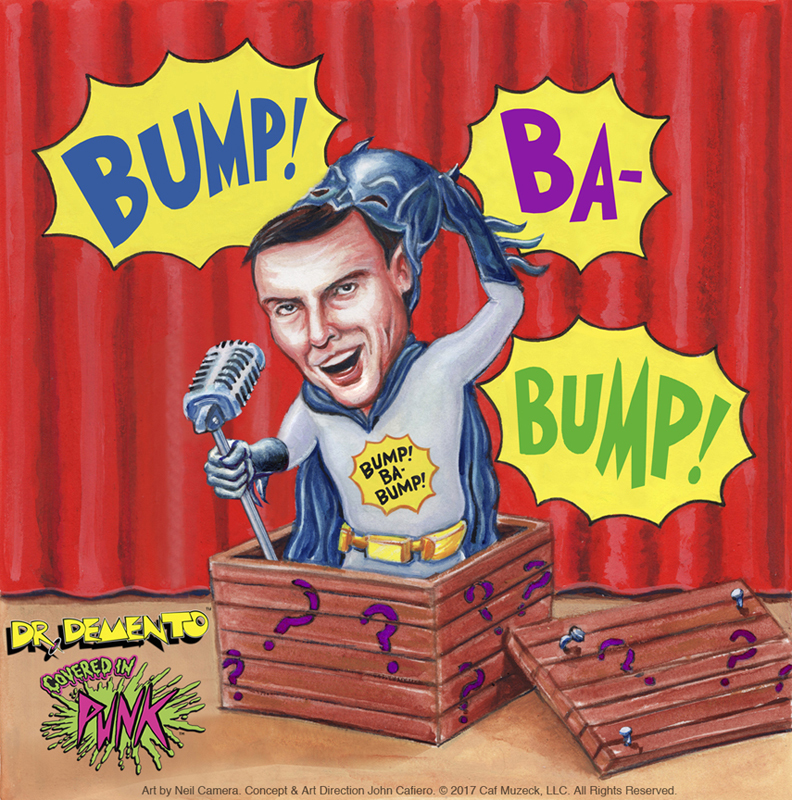 NEW YORK, NY – DECEMBER 15, 2017 – Demented Punk today unveiled the late Adam West’s cover of “The Thing,” originally performed by Phil Harris of the Jack Benny Show. “The Thing” was first released in 1950, where it spent four weeks atop the Billboard Pop charts and eventually became one of the most successful novelty songs of all time. West is famous for his iconic role as Batman in the 1960s TV series of the same name, the voice of reoccurring character “Mayor West” on the animated series “Family Guy,” and countless other appearances in TV and film. He contributed one of his final performances to this classic novelty track prior to passing earlier this year. “Adam West was a great guy and a real pleasure to work with—genuinely funny, good-natured and a total professional. It was an honor to have the chance to work with him. When he arrived at the studio, he pulled me aside and said, ‘I’m going to give you the greatest gift I can give you… I’m going to sing this song as Mayor West’, (his character on ‘Family Guy’). I replied and said, in all sincerity…’The greatest gift you can give me is to just be yourself, have fun with it, and perform the song as Adam West.’ He was taken aback, and within a few seconds of processing what I had just said, his face lit up, beaming with pride. I truly meant every word. Adam’s persona was larger than life, really colorful and vibrant. It was obvious during the session he was genuinely having fun with it, and I think you can hear that permeating throughout the track. He gave an incredible performance. 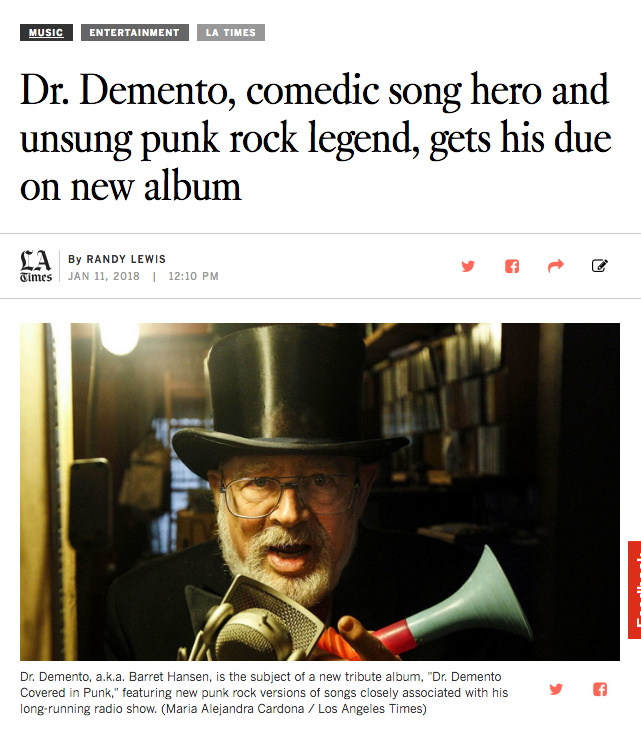 Dr. Demento Covered In Punk is a special two-hour demented punk extravaganza, structured like one of Demento’s original radio shows. This audio oddity is a modern-day homage to radio icon Dr. Demento, a world-renowned institution who has championed novelty music and its creators since the 1970s. The collection features an eclectic mix of artists from the world of classic and contemporary punk/indie/alt-rock, along with special guest stars from film, TV and more. “The Thing” is available now as an instant grat track to fans who preorder the physical album HERE and those who preorder it digitally from iTunes. 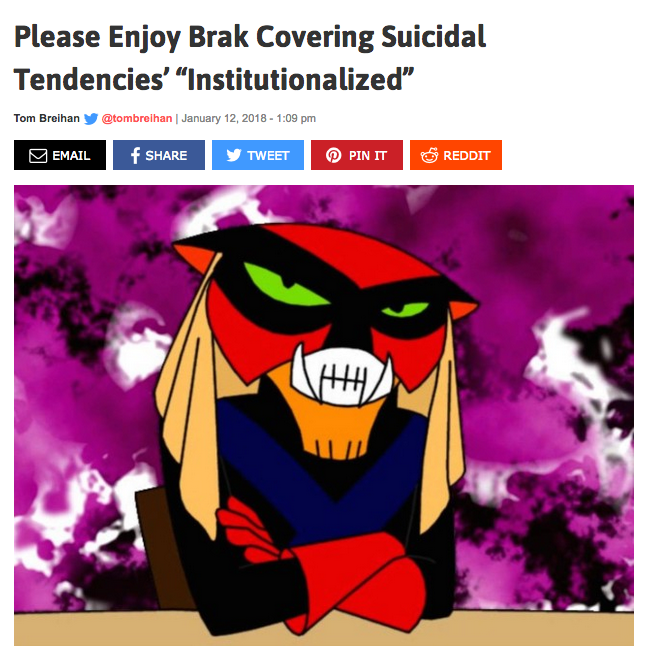 It can also be previewed HERE. Original artwork for “The Thing” was created by pop culture artist & enthusiast Neil Camera, known for Topps’ Garbage Pail Kids, Wacky Packages and Mars Attacks cards and sticker sets. Dr. Demento Covered In Punk features over thirty different, never before released, all-new ‘punk’ cover versions of ‘mad music and crazy comedy’ songs famously heard on the airwaves of the legendary “Dr Demento Show”- intermixed with ‘wild card’ tracks showcasing some incredible, newly ‘demented’ versions of punk-rock classics! 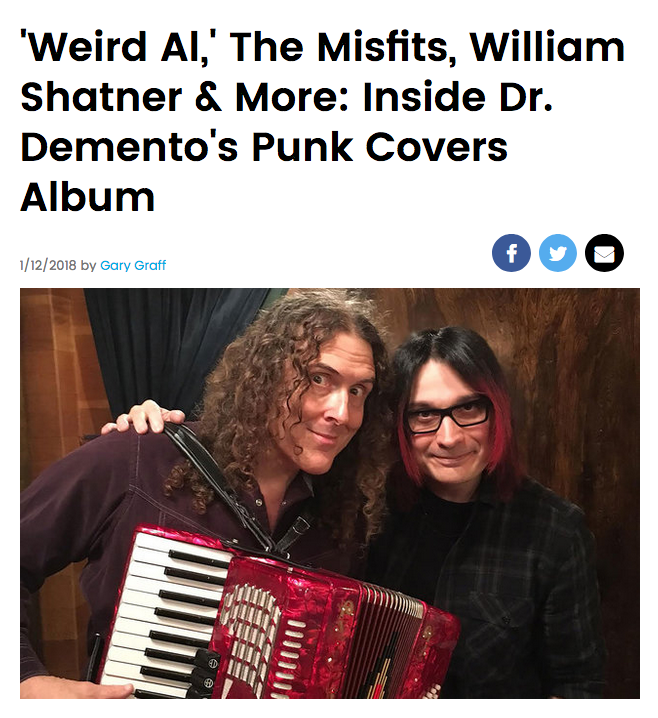 Joined by everyone from the Misfits, Joan Jett, Fred Schneider of the B52s, to “Weird Al” Yankovic, and Captain Kirk himself, William Shatner (to name just a few). The Doctor is in…and he’s ‘Covered in Punk’!! A full track listing can be found HERE. 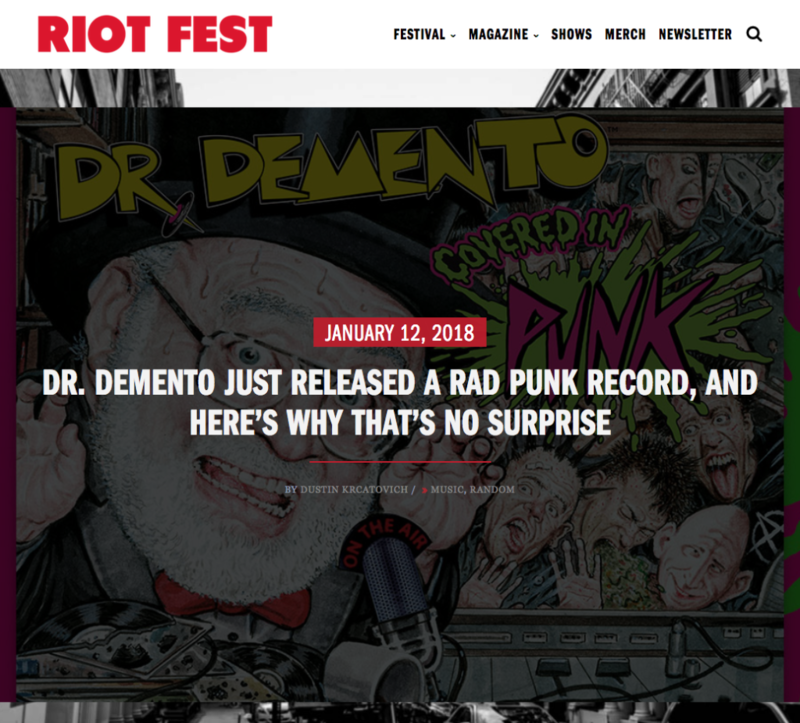 Dr. Demento Covered In Punk features over thirty different, never before released, all-new ‘punk’ cover versions of ‘mad music and crazy comedy’ songs famously heard on the airwaves of the legendary “Dr Demento Show”— intermixed with ‘wild card’ tracks showcasing some incredible, newly ‘demented’ versions of punk-rock classics! 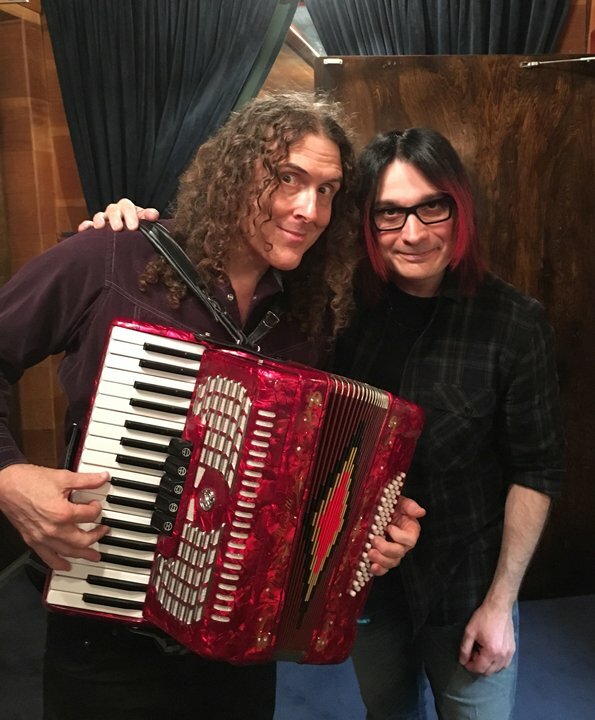 Joined by everyone from the Misfits, Joan Jett, Fred Schneider of the B52s, to “Weird Al” Yankovic, the late Adam “Batman” West (in one of his final performances), and Captain Kirk himself, William Shatner—(to name just a few). The Doctor is in…and he’s ‘Covered in Punk’!! A full track listing can be found HERE. Dr. Demento Covered In Punk includes an in-depth booklet with equally entertaining liner notes and personal quotes from the participating artists, a foreword by album producer and Demented Punk founder John Cafiero (Misfits, Ramones, Osaka Popstar), an afterword by Dr. Demento, as well as factoids, photos and an array of dynamic paintings and illustrations created exclusively for the project by a team of visual artists spanning the world of comic books, classic punk rock album covers, Topps trading cards series, Mad Magazine and More. The cover artwork for the album was created by iconic illustrator Drew Friedman whose work has appeared in countless publications from Entertainment Weekly and Time Magazine to Rolling Stone and the New Republic and just about everything in between.